Siena's great cathedral was begun in the 12th century in the Romanesque style but was transformed in the 13th century into one of the finest examples of Italian Gothic. The walls and columns of the church's interior are covered with black and white marble, and its marble floors have decorative inlays by Domenico Beccafumi. Pinturicchio painted frescoes for the Piccolomini Library, which adjoins the cathedral and which was founded in 1495 by Cardinal Francesco Piccolomini, who later became Pope Pius III. A magnificent baptismal font with bas-reliefs by Jacopo della Quercia, Donatello, and Lorenzo Ghiberti distinguishes the Church of San Giovanni, which serves as the crypt for the cathedral. 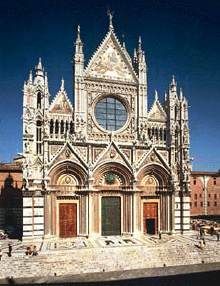 You can find more information on Siena Cathedral in the Wikipedia and on this page. Fountain by Jacopo della Quercia. The Web Gallery of Art contains 147 images of artworks from the Siena Cathedral and Baptistry.